Why choose TPO membrane roof ? Consciousness has much evolved in Quebec over the past 20 years. Climate change and the shift to greener options strongly influence building and renovation choices. 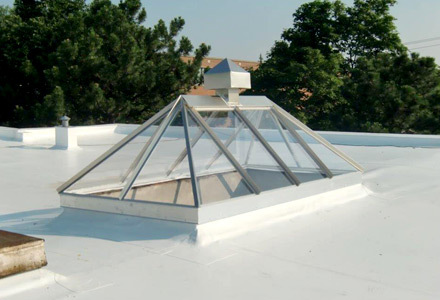 Typically white, TPO membranes (thermoplastic polyolefin) are quickly overtaking other roofing materials for refurbishing and waterproofing purposes. For both residential and commercial buildings, TPO is the ideal solution for flat roofs of any size. The membrane is mechanically attached to the roof surface, which saves on adhesives such as glue, making it a more cost-efficient and ecological solution. Depending on the choice of colour, lighter shades can be considered more energy efficient as they reflect the sun’s rays, which keeps roofs cooler. Once installed, inspection and modifications to this type of roofing are much easier even after many years of use. TPO membranes not only have outstanding longevity, they are highly resistant to UV radiation and bacteria proliferation. They are also competitively priced and sleek looking. In all, choosing this type of roofing proves to be an energy efficient option, as buildings stay cooler and therefore age more slowly. Toitures PME professionals are expertly trained to give you sound advice based on your needs.